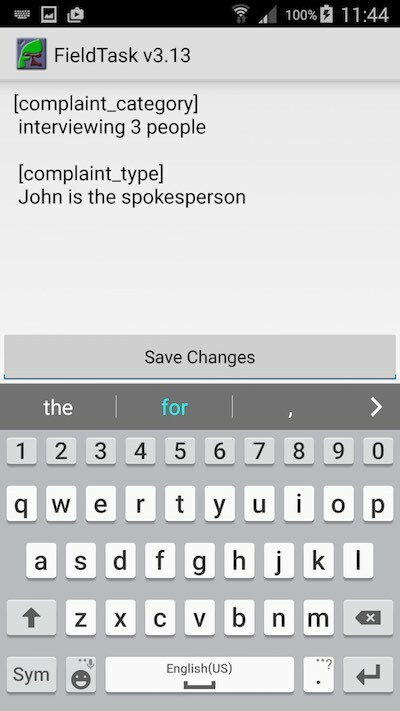 You can now record notes while you are completing a survey on fieldTask. Notes can also be added after a survey has been saved as complete and before it it submitted to the server. You will need version 3.13 of FieldTask for this feature. To add a note start the survey or task then select “menu” | “add comment”. Press the button “Save Changes” to save the comment or press the back button to discard it. Important. Only surveys added after version 16.03 of the server will have the notes saved. If you need this feature applied retrospectively to existing surveys let us know and we can make a quick database change that will allow that. Some people may consider it a security issue that the answers to completed surveys can now be reviewed on the phone. If this is an issue to anyone let us know and we will rush out a patch allowing the feature to be disabled on the server. It would also be possible to add a password to the form on the server that needs to be entered to review the completed survey. The above controls are more critical for ensuring security than preventing some people, who already are authorised to access the phone, from seeing the completed data. However as stated if you have a requirement for this we will add it. This entry was posted in Uncategorized on March 12, 2016 by Neil Penman.